AUGUSTA, Ga. -- Tuesday is always the biggest press conference day of Masters week, and this year's did not disappoint. We got Brooks Koepka telling Phil Mickelson stories, Mickelson confirming Mickelson stories, Rory McIlroy talking about the role of meditation in his life as well as what he's reading and Tiger Woods dishing on pretty much everything. Let's dive into some news and a few notes from a soggy Day at at Augusta National. • I got to the course really early, and it poured for most of the morning. It got so wet at one point that my shoes were sinking into the ground. It probably won't matter come Thursday and Friday, but the more rain the better for Rory McIlroy, Dustin Johnson, Brooks Koepka, Jon Rahm and others. Why? I'll let Mark Broadie explain from a question I emailed him last year about how the longer you make courses the more it favors longer hitters: For example, having 160 to the pin rather than 180 is worth about 0.09 strokes. Having 210 versus 230 is worth about 0.15 strokes. That is, it's better to be closer from a long distance than closer from a short distance. • Speaking of Koepka, here's his hilarious Mickelson story. "I think I've told this story, about how I tried to get Phil's autograph. I was standing by the old range, and somehow found my way kind of right by the parking lot or something like that and asked him for an autograph, and he said no. He turned me down, probably about the only kid Phil's ever turned down. And he told me years later, I shouldn't have been in the parking lot so fair enough." "Yeah, well he shouldn't have been there. I think I told him that, too." • This is an elite tweet and great thread on how far the Big Cat has come. 2017: Whispers across the table "I'm done. I won't play golf again." • Speaking of Woods, he wore a Frank the Tiger (his headcover) logo on his shirt on Tuesday. • McIlroy has spent the entire year talking about the separation between church and state (his personal life and his professional one). He even talked a little on Tuesday about the role meditation, juggling (!) and self-reflection have played on his current attitude. "I've dabbled in [introspection] over the years, and I've needed it from time to time. But I never fully immersed myself in it. You know, even last year, dabbled with meditation. ... Maybe what resonates with me is isn't going to resonate with someone else, but I found what I feel is the best path forward for me and I've committed to it. It's still so early in the process. "So very early stages, but I just felt for me to live a healthier life and not just with my career, but away from the golf course, as well, I needed to ‑‑ I just needed some of this. I needed some perspective and I needed to separate the sort of two lives that I have. "I'm not going to go and live with the monks for a couple months in Nepal, but just to be able to get your mind in the right place and be able to focus and to center yourself. ... I meditated for 20 minutes on the Sunday morning of the Players. My routine now consists of meditation, juggling, mind training, you know, doing all the stuff to get yourself in the right place." • I'm pleasantly surprised at how terrific Patrick Reed's champions dinner menu is. • Nothing gets pros' poetic juices going like rolling down Magnolia Lane. Here are Mickelson and McIlroy independent of one another when talking about Augusta National. Mickelson: "This is a place that you drive up Magnolia Lane and things just change for everyone. You just have that special feeling, that special remembrance of when you were a kid and dreaming of coming here and playing, and it brings out oftentimes the best in everyone." McIlroy: "It's lovely. My best experiences of Augusta have been when it's not Masters week. It's quiet. It's serene. You know ... you could describe it as a spiritual place. I feel like when you get on the grounds at Augusta, when it's not Masters week, it's very similar to walking into an empty church. It's just got that aura, that feel, and it's a really nice place to be." • Apropos of nothing, I love this picture of Tiger. • I was up on the first tee with nobody else on the course at around 8 a.m., and there's Lucas Bjerregaard getting ready to brave the weather and play a practice round. He didn't get too much of it in because a few hours later everyone was removed from the course for three hours, but I don't fault a guy for trying to get all of his Masters week work in at his very first appearance here. 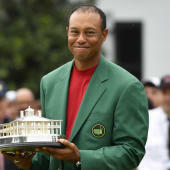 • It was fun to hear Tiger reminisce about his past glory here. "I think it's fun for me, the fact that I can get people fired up like that, and they enjoy something I love to do. I get a rush out of pulling off shots that sometimes I only dreamed about pulling off, and to see some of the reactions. I remember seeing the video later after I had holed that shot on 16 in 2005, and there was a gentleman in the back that you look at it from the camera, I think it was towards 15 green. I mean, he just slams his hat on the ground. "That's fun. It's exciting to be part of situations like that, that people will look back on my career and say, 'I saw him pull this shot off.' Some of my best shots I've ever pulled off have been here. It's just a very special place and I get excited about it." • Mickelson also confirmed the hilarious Jake Owen story from last week about the time Mickelson told him he won 90,000 $100 bills. "It happened exactly like he said. Jake nailed it, verbatim. Rickie Fowler and I were talking, he was right there, Jake had a bunch of buddies behind him and thought he would show off a little bit and I kind of shot him down, so, yeah. I can't tell it any better than he can. You know, it's much better coming from him." • A lot of the pre-tournament chatter this year has been around the lack of phones at Augusta. That's always a talking point, and certainly folks have written the piece before, but I'm not sure it's been as prevalent in a world where we know what these devices are doing to (and how they're harming) our brains. Players notice it this week, too, as patrons are actually paying attention and interacting instead of just sharing their lives away on social media.